I spent yesterday in Harrisburg, PA at the Region III National Disaster Recovery Framework (NDRF) Stakeholder Engagement Workshop. While it was great to see so many emergency management professionals dedicated to recovery, it was also quite clear that these types of discussions about recovery are just the beginning of crucial recovery planning at every level. Collectively, we’ve spent enormous resources on response and now, with the NDRF, our focus is being re-adjusted to better understanding–and planning–recovery. 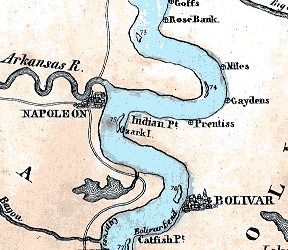 In 1884, a flood inundated the town of Napoleon, Arkansas. The flood occurred before the Stafford Act, no significant recovery operations were implemented, and the town never recovered. In fact, they say during low tide you can still see remnants of Napoleon in the sandbars of the Mississippi River near where the town originally stood. The fate of Napoleon, Arkansas is a symbol of failed recovery. As our capabilities, technology, and institutions of government have matured, the processes for federal assistance for disaster relief and recovery were codified and they seemed to work well. Hurricane Camille, the 1993 “Storm of the Century”, the 1972 Rapid City Flood (which claimed 238 lives), and the Northridge Earthquake all received disaster declarations and required major disaster relief by the United States Federal government. The prolonged suffering after Hurricane Katrina re-enforced the moral imperative of well-designed recovery–at every level. Katrina was the catalyst for the entire emergency management industry to re-examine and redefine recovery. It’s taken years but we are now advancing new concepts and completely new schools of thought regarding recovery. ESF-14 Long-Term Community Recovery (LTCR) was the first formal promulgation of strategy for implementing untraditional methods of recovery. While LTCR is emblematic of the Whole Community approach, is still a very reactive process. NDRF takes most of the principles of LTCR and shapes the implementation of those principles into a recovery continuum. The NDRF encourages proactive, pre-disaster planning at all levels of government. While the annexes for each of the RSFs are in the works, there is still an enormous amount of effort needed to develop pre-disaster recovery plans at all levels of government and community development. In order to avoid future Napoleons, we must prepare for a meticulously well-designed recovery.